Living a Fit and Full Life: Why Cats Want and Need their Own Space and How the Armarkat Classic Cat Tree A4801 can Help! Why Cats Want and Need their Own Space and How the Armarkat Classic Cat Tree A4801 can Help! We have three cats in my house and while they're all quite different I can say with certainty that they love having their own space. This is why my cat's have a space all their own. While it my not be a room specifically for them, it's definitely theirs. Our laundry room is quite large so it was the perfect space to set up as their space. In it you will find their food, water, litter boxes, toys, and cat tree (pictured above). It's their sanctuary where they can go when they need a little peace and quite. With four kids in my house, the cats can get overwhelmed at times so when then the cats are in the laundry room it's their safe space. My kids have to leave them alone and give them space. Don't get me wrong, our cats love my kids. In fact our large black cat Bella is my daughter's best friend and rarely leaves her side. She even sleeps with her at night but still at times, needs her space. We also have a calico cat that we rescued from the Humane Society awhile back who is very shy and doesn't really like a lot of attention but loves to be petted. She utilizes the cat room quite a bit and one of her favorite spots is in the cubby of the cat tree. We then have a kitten who is about 9 months who loves to be everywhere but her favorite spot is playing with the cat toys in the cat room or chasing my three year old around while he pulls a string. Cats can be very social at times but they like to be able to choose when they're social and when they don't have to be. I know many of my kid's friends want to play with our cats but they know the rule in our house is if the cat doesn't come out to see you when you call it or bring out a toy then we need to give them their space. Often time when visitors come my cats, like many cats prefer to keep their distance. Sometimes when the doorbell rings my cats will head for their safe space because that's where they feel comfortable. Often times they head for the highest perch on the cat tree. Yes, sometimes I find all three on the cats on the same perch. This provides a visual advantage to see better and have an elevated, out of reach area away from small children or vacuums and such. My cats absolutely love their Armarkat Classic Cat Tree A4801 because it allows them a comfortable place to rest, play and hide. 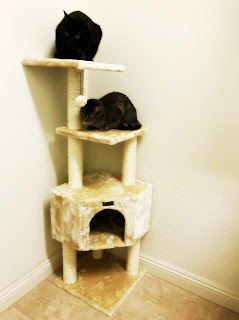 The Armarkat Classic Cat Tree A4801 was extremely easy to put together, in fact my ten year old and I had it assembled in less than ten minutes. It's extremely well made and our three cats absolutely love it!